The Light Foundation recently awarded to four students from Darke County. Pictured left to right are Bailey Stammen of Ansonia, Pete Barga of Versailles, The Light Foundation founder Matt Light and Landin Brown of Greenville. Alexis Shinn of Ansonia is not pictured. Each student received a $1,000 scholarship toward their college education. Alexis Shinn of Ansonia was one of The Light Foundation’s four Darke County Scholarships winners. 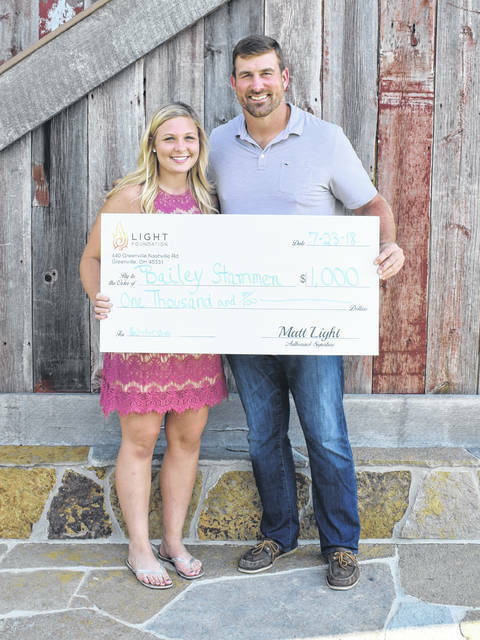 She is pictured with The Light Foundation founder Matt Light. Bailey Stammen of Ansonia was one of The Light Foundation’s four Darke County Scholarships winners. 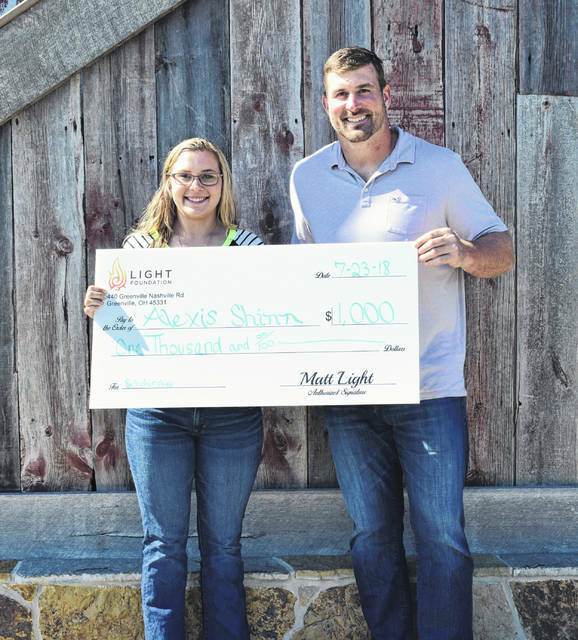 She is pictured with The Light Foundation founder Matt Light. Landin Brown of Greenville was one of The Light Foundation’s four Darke County Scholarships winners. 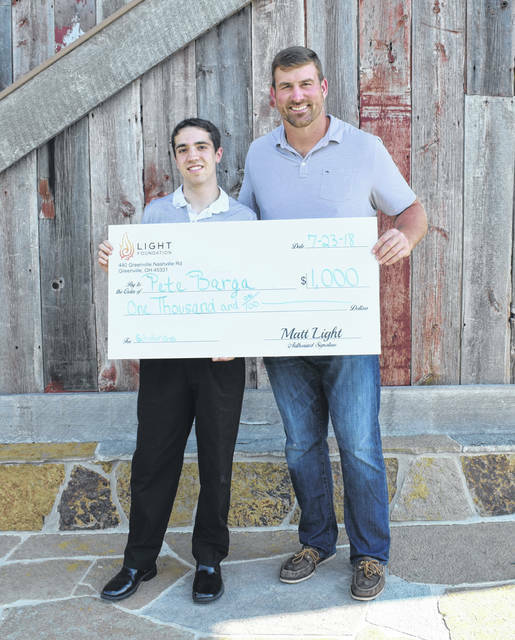 He is pictured with The Light Foundation founder Matt Light. Pete Barga of Versailles was one of The Light Foundation’s four Darke County Scholarships winners. 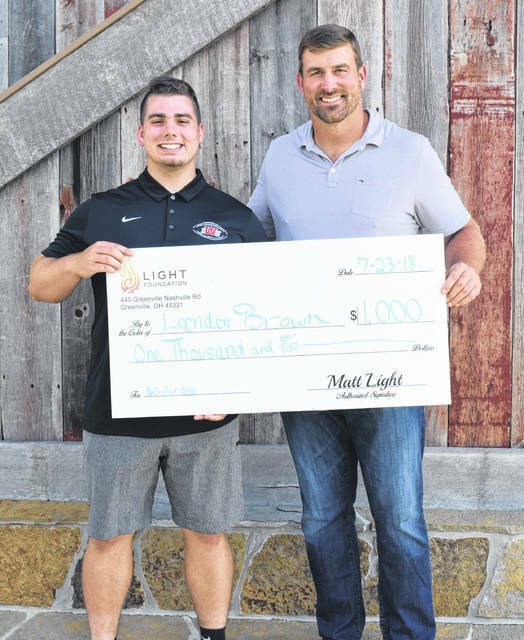 He is pictured with The Light Foundation founder Matt Light. DARKE COUNTY — The Light Foundation recently awarded scholarships to four Darke County students. 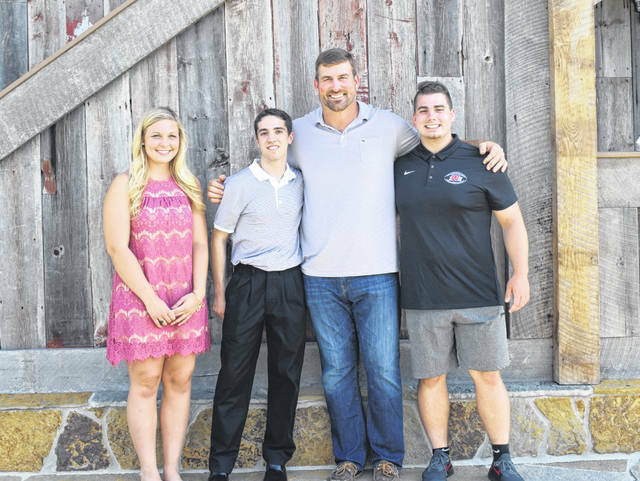 Bailey Stammen of Ansonia High School, Landon Brown of Greenville High School, Alexis Shinn of Ansonia, and Pete Barga of Versailles were each awarded a $1,000 scholarship from the Light Foundation, a nonprofit foundation formed by Greenville native and three-time Super Bowl champion Matt Light. Stammen and Brown were the Light Foundation’s Traditional Scholarship winners while Shinn and Barga were their Rising Star Scholarship winners. All four winners will be heading off to college to further their education and pursue their individual goals. Pete Barga is attending Bowling Green State University where he will be pursuing a degree in Digital Arts. Alexis Shinn is pursuing a degree in Phlebotomy this fall at Edison State Community College. Bailey Stammen has been accepted into the nursing program at Wright State University and Landin Brown will be attending Indiana Wesleyan University where he will be playing football and pursuing a degree in Graphic Design. The Darke County Scholarship Program was created to assist students from Darke County with the financial burden that higher education often comes with. “I am so proud of what this organization has been able to do for my hometown community – they really deserve it. Education is so important and being able to alleviate even a little bit of financial stress for these students is something we love to do” said Founder Matt Light. Eligible students must fill out the scholarship application, which is posted at the beginning of the year and due by the end of April. Founded in 2001 by Matt and Susie Light, The Light Foundation gives kids opportunities they wouldn’t otherwise have to get outside and take on a challenge or to strive for excellence in their academic pursuits. The Light Foundation strives to instill and augment the values of responsibility, accountability, and hard work by providing youth with unique outdoor learning experiences that assist them in reaching their highest potential. Its goal is to lead young people down a path to becoming responsible members of their communities who are capable of passing on the torch of leadership and achievement to their friends and families. This entry was tagged Alexis Shinn, Bailey Stammen, Landin Brown, Matt Light, Pete Barga, The Light Foundation. Bookmark the permalink.